حسنی نژاد درزی, سید کریم, رضوانی, روزبه, پورعلی, سیده معصومه. (1397). الکترواکسایش فرمالدهید با استفاده از الکترود خمیر کربن اصلاح شده با نانوزئولیت MCM-41 دارای نقره. 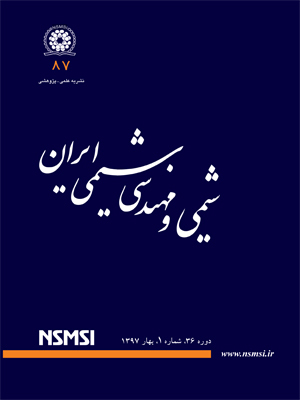 نشریه شیمی و مهندسی شیمی ایران, 37(1), 51-61. سید کریم حسنی نژاد درزی; روزبه رضوانی; سیده معصومه پورعلی. "الکترواکسایش فرمالدهید با استفاده از الکترود خمیر کربن اصلاح شده با نانوزئولیت MCM-41 دارای نقره". نشریه شیمی و مهندسی شیمی ایران, 37, 1, 1397, 51-61. حسنی نژاد درزی, سید کریم, رضوانی, روزبه, پورعلی, سیده معصومه. (1397). 'الکترواکسایش فرمالدهید با استفاده از الکترود خمیر کربن اصلاح شده با نانوزئولیت MCM-41 دارای نقره', نشریه شیمی و مهندسی شیمی ایران, 37(1), pp. 51-61. حسنی نژاد درزی, سید کریم, رضوانی, روزبه, پورعلی, سیده معصومه. الکترواکسایش فرمالدهید با استفاده از الکترود خمیر کربن اصلاح شده با نانوزئولیت MCM-41 دارای نقره. نشریه شیمی و مهندسی شیمی ایران, 1397; 37(1): 51-61.
:با توجه به اهمیت سامانه ­های پیل سوختی، در این پژوهش تلاش شد تا با توسعه ­ی یک سامانه الکترودی مناسب و کارا، در این زمینه گامی برداشته شود. از سویی دیگر اهمیت ترکیب­ های نانو ساختار در زمینه‌ی الکتروشیمی ما را به سمت استفاده از زئولیت­ های نانو متخلخل سیلیکاتی(MCM-41) به همراه نانوذره­های نقره در ساخت الکترود رهنمون کرد. شناسایی نانوزئولیت با استفاده از فناوری­ های پراش پرتوی ایکس((XRD، طیف ­سنجی فروسرخ تبدیل فوریه (FT-IR) و فناوری میکروسکوپ الکترونی روبشی گسیل میدانی (FESEM) انجام شد. سپس، با نانوزئولیت سنتزی دارای نانوذره ­های نقره الکترود اصلاح شده‌ی خمیر کربنی تهیه شد و از آن برای اکسایش الکتروکاتالیستی فرمالدهید استفاده شد. مطالعه­ های مکانیسم و سینتیک واکنش با استفاده از فناوری­ های ولتامتری چرخه ­ای و کرونوآمپرومتری انجام شد. نتیجه­ ها نشان دادند که الکترودهای اصلاح شده با MCM-41 و نانوذره ­های نقره چگالی­ های جریان خیلی بیش ­تر و پتانسیل اضافی کم ­تری نسبت به الکترود خمیرکربن برهنه را برای استفاده در پیل سوختی ایجاد کردند. Xing X., Xiao X., Wang L., Wang Y., Highly Sensitive Formaldehyde Gas Sensor Based on Hierarchically Porous Ag-Loaded ZnO Heterojunction Nanocomposites, Sensor. Actuat. Zhang T., Qin L., Kang S.-Z., Li G., Li X., Novel Reduced Graphene Oxide/Ag Nanoparticle Composite Film with Sensitive Detection Activity Towards Trace Formaldehyde, Sensor. Actuat. B-Chem., 242: 1129-1132 (2017). Castro-Hurtado I., Mandayo G., Castaño E.,Conductometric Formaldehyde Gas Sensors. A Review: From Conventional Films to Nanostructured Materials, Thin Solid Films, 548: 665-676 (2013). Usui Y., Sato K., Tanaka M., Catalytic Dihydroxylation of Olefins with Hydrogen Peroxide: An Organic‐Solvent‐and Metal‐Free System, Angew. Chem. Int. Ed., 42(45): 5623-5625 (2003). Jin Z., Li P., Liu G., Zheng B., Yuan H., Xiao D., Enhancing Catalytic Formaldehyde Oxidation on CuO–Ag2O Nanowires for Gas Sensing and Hydrogen Evolution, J. Mater. Chem. A, 1(46): 14736-14743 (2013). Dumas T., Determination of Formaldehyde in Air by Gas Chromatography, J. Chromatogr. A, 247(2): 289-295 (1982). Yasri N.G., Seddik H., Mosallb M.A., Spectrophotometric Determination of Formaldehyde Based on the Telomerization Reaction of Tryptamine, Arab. J. Chem., 8(4): 487-494 (2015). Ferapontova E.E., Grigorenko V.G., Egorov A.M., Börchers T., Ruzgas T., Gorton L., Mediatorless Biosensor for H2O2 Based on Recombinant Forms of Horseradish Peroxidase Directly Adsorbed on Polycrystalline Gold, Biosens. Bioelectron., 16(3): 147-157 (2001). Hassaninejad‐Darzi S., Rahimnejad M., Golami‐Esfidvajani M., Electrocatalytic Oxidation of Formaldehyde onto Carbon Paste Electrode Modified with Nickel Decorated Nanoporous Cobalt‐Nickel Phosphate Molecular Sieve for Fuel Cell, Fuel Cells, 16(1): 89-99 (2016). Hassaninejad–Darzi S.K., A Novel, Effective and Low Cost Catalyst for Formaldehyde Electrooxidation Based on Nickel Ions Dispersed onto Chitosan-Modified Carbon Paste Electrode for Fuel Cell, J. Electroceram., 33(3-4): 252-263 (2014). Ojani R., Raoof J.-B., Safshekan S., Electrocatalytic Oxidation of Formaldehyde on Nickel Modified Ionic Liquid Carbon Paste Electrode as a Simple and Efficient Electrode, J. Appl. Electrochem., 42(2): 81-87 (2012). Rahimnejad M., Hassaninejad-Darzi S., Organic Template-Free Synthesis of Ni-ZSM-5 Nanozeolite: a Novel Cata-Lyst for Formaldehyde Electrooxidation onto Modified Ni-ZSM-5/CPE, Int. J. Bio-Inorg. Hybr. Nanomater, 4(3): 141-153 (2015). Azizi S.N., Ghasemi S., Amiripour F., Nickel/P Nanozeolite Modified Electrode: a New Sensor for the Detection of Formaldehyde, Sensor. Actuat. B-Chem., 227: 1-10 (2016). Azizi S.N., Ghasemi S., Derakhshani-mansoorkuhi M., The Synthesis of Analcime Zeolite Nanoparticles Using Silica Extracted from Stem of Sorghum Halepenesic Ash and Their Application as Support for Electrooxidation of Formaldehyde, Int. J. Hydrogen Energy, 41(46): 21181-21192 (2016). Kavian S., Azizi S.N., Ghasemi S., Fabrication of Novel Nanozeolite-Supported Bimetallic Pt Cu Nanoparticles Modified Carbon Paste Electrode for Electrocatalytic Oxidation of Formaldehyde, Int. J. Hydrogen Energy, 41(32): 14026-14035 (2016). Habibi B., Ghaderi S., Electrooxidation of Formic Acid and Formaldehyde on the Fe3O4@ Pt Core-Shell Nanoparticles/Carbon-Ceramic Electrode, Iran. J. Chem. Chem. Eng. (IJCCE), 35(4): 99-112 (2016). Dai Z., Liu S., Ju H., Direct Electron Transfer of Cytochrome c Immobilized on a NaY Zeolite Matrix and Its Application in Biosensing, Electrochim. Acta, 49(13): 2139-2144 (2004). Nam J.-H., Jang Y.-Y., Kwon Y.-U., Nam J.-D., Direct Methanol Fuel Cell Pt–Carbon Catalysts by Using SBA-15 Nanoporous Templates, Electrochem. Commun., 6(7): 737-741 (2004). Zen J.-M., Chen P.-J., An Ultrasensitive Voltammetric Method for Dopamine and Catechol Detection Using Clay-Modified Electrodes, Electroanalysis, 10(1): 12-15 (1998). Kresge C., Leonowicz M., Roth W., Vartuli J., Beck J., Ordered Mesoporous Molecular Sieves Synthesized by a Liquid-Crystal Template Mechanism, Nature, 359: 710-712 (1992). Beck J., Vartuli J., Roth W.J., Leonowicz M., Kresge C., Schmitt K., et al., A New Family of Mesoporous Molecular Sieves Prepared with Liquid Crystal Templates, J. Am. Chem. Soc., 114(27): 10834-10843 (1992). Ahmadi Nasab N., Hassani Kumleh H., Kazemzad M., Ghavipanjeh F., Application of Spherical Mesoporous Silica MCM-41 for Adsorption of Dibenzothiophene (A Sulfur Containing Compound) from Model Oil, Iran. J. Chem. Chem. Eng. (IJCCE), 33(3): 37-42 (2014). Lv L., Wang K., Zhao X., Effect of Operating Conditions on the Removal of Pb2+ by Microporous Titanosilicate ETS-10 in a Fixed-Bed Column, J. Colloid Interface Sci., 305(2): 218-225 (2007). Miyake Y., Yosuke M., Azechi E., Araki S., Tanaka S., Preparation and Adsorption Properties of Thiol-Functionalized Mesoporous Silica Microspheres, Ind. Eng. Chem. Res., 48(2): 938-943 (2009). Creasy K.E., Shaw B.R., Simplex Optimization of Electroreduction of Oxygen Mediated by Methyl Viologen Supported on Zeolite-Modified Carbon Paste Electrode, Electrochim. Acta, 33(4): 551-556 (1988). Santos M., Bulhoes L., Electrogravimetric Investigation of Formaldehyde Oxidation at Pt Electrodes in Acidic Media, Electrochim. Acta, 49(12): 1893-1901 (2004). Liu X., Sun H., Yang Y., Rapid Synthesis of Highly Ordered Si-MCM-41, J. Colloid Interface Sci., 319(1): 377-380 (2008). Klug H.P., Alexander L.E.,“X-Ray Diffraction Procedures: For Polycrystalline and Amorphous Materials”, 2nd ed., Wiley-VCH, New York,(1974). Shen S., Chow P.S., Chen F., Tan R.B.H., Submicron Particles of SBA-15 Modified with MgO as Carriers for Controlled Drug Delivery, Chem. Pharm. Bull., 55(7): 985-991 (2007). Hassaninejad-Darzi S.K., Fabrication of a Non-Enzymatic Ni (ii) Loaded ZSM-5 Nanozeolite and Multi-Walled Carbon Nanotubes Paste Electrode as a Glucose Electrochemical Sensor, RSC Adv., 5(128): 105707-105718 (2015). Venkatathri N., Pillai K.V., Rajini A., Raju M.N., Reddy I.A.K., Structural and Catalytic Properties of a Novel Vanadium Containing Solid Core Mesoporous Shell Silica Catalysts for Gas Phase Oxidation Reaction, J. Chem. Sci., 125(1): 63-69 (2013). Chowdhury S.R., Ghosh S., Bhattachrya S.K., Improved Catalysis of Green-Synthesized Pd-Ag Alloy-Nanoparticles for Anodic Oxidation of Methanol in Alkali, Electrochim. Acta, 225: 310-321 (2017). Samadi-Maybodi A., Ghasemi S., Ghaffari-Rad H., A Novel Sensor Based on Ag-loaded Zeolitic Imidazolate Framework-8 Nanocrystals for Efficient Electrocatalytic Oxidation and Trace Level Detection of Hydrazine, Sensor. Actuat. B-Chem., 220: 627-633 (2015). Bard A.J., Faulkner L.R., “Electrochemical Methods, Fundamentals and Applications”, 2nd ed. ; Wiley-VCH, New York,(2001). Hassaninejad-Darzi S.K., Rahimnejad M., Shajie F., Kootenaei A.H.S., Electrocatalytic Oxidation of Formaldehyde onto Carbon Paste Electrode Modified with Hydrogen Titanate Nanotubes, Including Nickel Hydroxide, Iran. J. Sci. Technol. A, 42(3): 1259-1268 (2018). Kavian S., Azizi S.N., Ghasemi S., Preparation of a Novel Supported Electrode Comprising a Nickel (II) Hydroxide-modified Carbon Paste Electrode (Ni(OH)2-X/CPE) for the Electrocatalytic Oxidation of Formaldehyde, Chinese J. Catal., 37(1): 159-168 (2016). Yu Y., Su W., Yuan M., Fu Y., Hu J., Electrocatalytic Oxidation of Formaldehyde on Nickel Ion Implanted-Modified Indium Tin Oxide Electrode, J. Power Sources, 286: 130-135 (2015). Ojani R., Safshekan S., Raoof J.-B., Silver Nanoparticle Decorated Poly (2-aminodiphenylamine) Modified Carbon Paste Electrode as a Simple and Efficient Electrocatalyst for Oxidation of Formaldehyde, Chinese J. Catal., 35(9): 1565-1570 (2014). Geng J., Bi Y., Lu G.,Morphology-Dependent Activity of Silver Nanostructures Towards the Electro-Oxidation of Formaldehyde, Electrochem. Commun., 11(6): 1255-1258 (2009).